- From your hand between your knuckles and wrist to about 2" (5.1 cm) past your elbow. This will be the length of it (M1). - The circumference of your wrist and subtract 1/2" or 1.3 cm (M2). At the wrist part draw a straight line 1 1/4" (3.2 cm) across. Draw another 1/4" (0.6 cm) away from the first, then from the second line draw another line 1" (2.5 cm) from that one. Draw another line 1/4" (0.6 cm) from that one. 1" (2.5 cm) from your newest line, draw another, and finally draw one more line 1/4" (0.6 cm) from it. You will have a total of six lines. You now should have 3 bars that are 1" (2.5 cm) wide with 2 lines 1/4" (0.6 cm) between them. Find the center at the wrist and draw 2 lines 3/4" (1.9 cm) long on either side of the center perpendicular to the wrist bars. From those lines draw 1/4" (0.6 cm) on either side and 1 1/2" (3.8 cm) from those draw another. 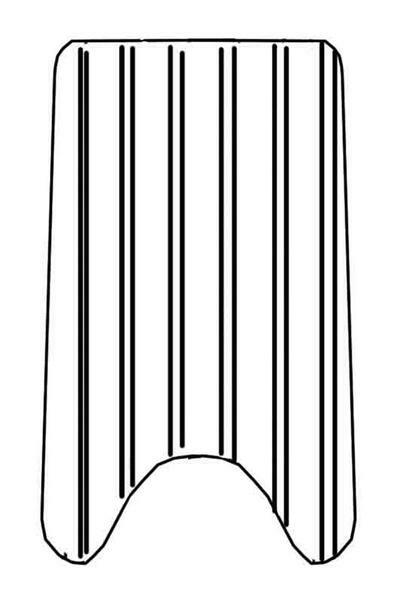 Keep doing this with 1 1/2" (3.8 cm) bars with 1/4" (0.6 cm) separating each line drawn. 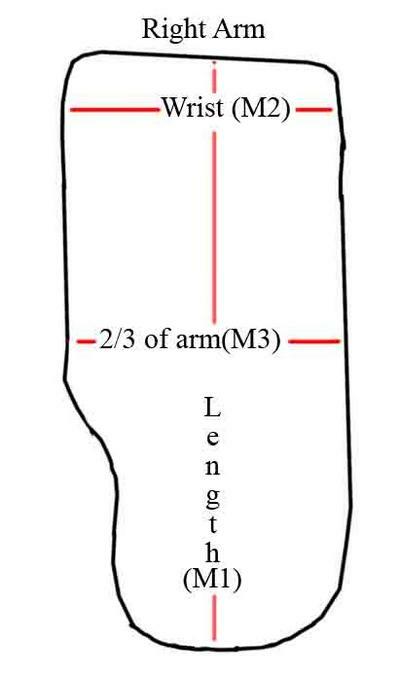 Measure 1" (2.5 cm) below the knee to above the ankle (M4). 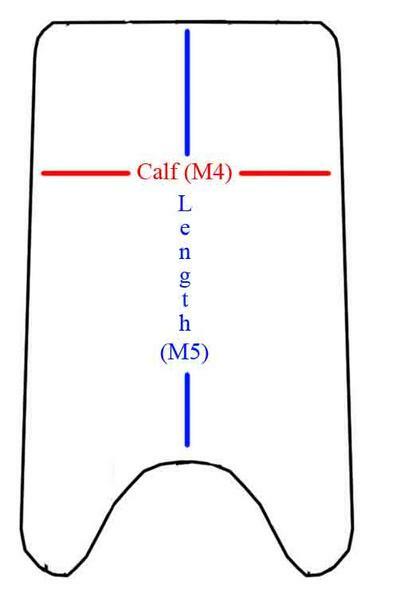 Measure from biggest part of your calf and subtract 4 1/2" or 11.4 cm (M5). 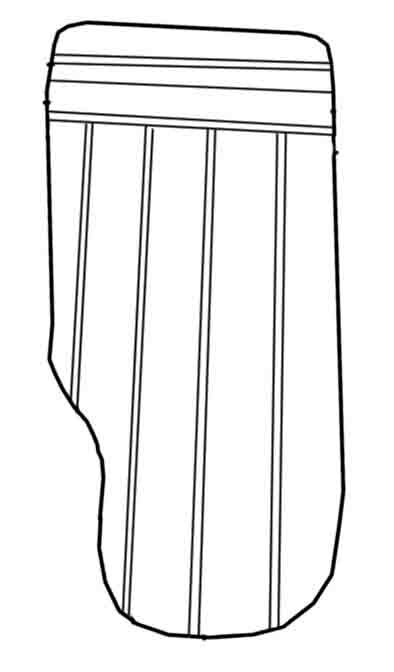 Using the same method as the arm guards, find the center and on each side draw a line 1" (2.5 cm) from that center. Each bar is 2" (5.1 cm) wide separated with 2 lines 1/4" (0.6 cm) apart. Cut out strips 1 1/4" (3.2 cm) wide of white fabric. Fold over 1/4" (0.6 cm) on each side and sew. 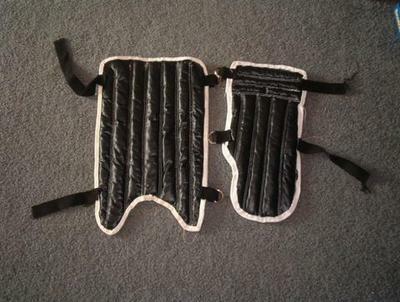 Take the straps and cut out 8 strips about 3" (7.6 cm) long to hold the D-rings.